The following links provide comprehensive details about travel from airports as well as transport in the New Forest and Southampton area. Southampton International Airport is located closest to the Wessex Institute and offers flights from a range of European cities across France, Spain, Italy, Ireland, Germany, Portugal, Switzerland, Belgium, Austria and the Netherlands with Flybe. Rail: Southampton Airport Parkway station is less than 50 metres from the airport terminal. Frequent services connect to Southampton Central station - please see Rail travel in the UK for onward travel details from these stations. Road: The airport is located 1km from Junction 4 of the M27 motorway. Several car hire companies operate at the airport and the 25km journey to the Wessex Institute will take approximately 35 minutes. Taxis are readily available from the airport and will cost approximately £35 to Ashurst Lodge. Bournemouth International Airport offers flights to and from many European cities including Alicante, Barcelona (Girona), Faro, Malaga, Murcia, Palma (Mallorca) and Pisa with Ryanair. Rail: Shuttle buses travel hourly from the airport terminal to Bournemouth Rail Station, between 7am and 6.30pm, seven days a week, costing £4. From Bournemouth, trains run direct to Southampton Central station – please see Rail travel in the UK for onward travel details. Heathrow is the UK's largest international airport with regular arrivals from cities across all continents with most major airlines. The airport is located 22km west of central London, at junction 14 of the M25 motorway. Coach: National Express coaches travel throughout the day to Southampton, a single ticket will cost approximately £15.00 and should be booked in advance at www.nationalexpress.com. Rail: BAA's Heathrow Express connects the airport to London Waterloo station, where trains depart to Southampton Central - www.heathrowexpress.com. Please see Rail travel in the UK for onward travel details. Gatwick is one of the busiest airports in the UK, with flights from many European cities and other international airports. A large number of low-cost airlines offer flights to Gatwick from across Europe. The airport is located 45km south of London, and is directly linked to the M23 motorway at Junction 9. Rail: The airport rail station is part of the airport’s South Terminal building, and can be reached by a free transit link from North Terminal. Direct trains run hourly during the day to Southampton Central station. For directions from this station, please see Rail travel in the UK. Coach: National Express coaches travel throughout the day to Southampton, a single ticket will cost approximately £22.00 and should be booked in advance at www.nationalexpress.com. Road: Most major hire companies operate at Gatwick. Join the M23 on leaving the airport, and then take the M25, M3 and M27 motorways to Southampton. Directions can be found in Road travel in the UK. If you prefer to travel by taxi, you should expect to pay a considerable amount. Flybe operates regular flights to Southampton International airport from cities across the UK including Edinburgh, Glasgow, Manchester, Newcastle and Aberdeen. Southampton Central is the closest major rail station to the Wessex Institute. Direct trains arrive from London Waterloo every half an hour on weekdays, less frequently at evenings and weekends. Taxi: Taxis are readily available at both station exits, travel to the Wessex Institute will cost approximately £18. Local Bus: Bluestar bus number 6 departs during the day from the station (exit at Platform 1) to the New Forest. A request stop is situated near the turning to the Wessex Institute, between Ashurst and Lyndhurst. This bus stop is approximately 1km from the Wessex Institute. A single fare should cost less than £5, and timetables can be found online at BlueStar Bus Number 6 Timetable Please note that services are reduced considerably at weekends. If you travel to Ashurst New Forest station, it is essential to book a taxi in advance by telephoning +44 (0)23 8029 3399 or 0800 66 66 66 (in the UK only) as taxis do not wait at the station. The short journey will cost approximately £6.50. We do not recommend walking from the station to the Wessex Institute. 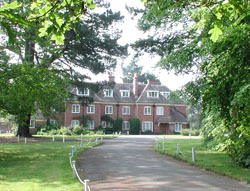 The Institute can be reached by leaving the M27 motorway at Junction 3 and joining the M271. From there, join the A35, signposted to Lyndhurst. The entrance to the Wessex Institute is approximately 1km past the village of Ashurst and 5km from the Junction of the M271 and A35. Ample parking can be found at the Institute. Below are a selection of local hotels you may wish consider if visiting Ashurst Lodge. Please consider the distance from each hotel to Ashurst Lodge before making a reservation.